Thermo-Kool’s own mission to be the leading walk-in and blast chiller/shock freezer manufacturer by providing superior products and services that exceed the expectations of our customers make Thermo-Kool walk-ins a perfect fit for the state of the art facility located in Cary, North Carolina. 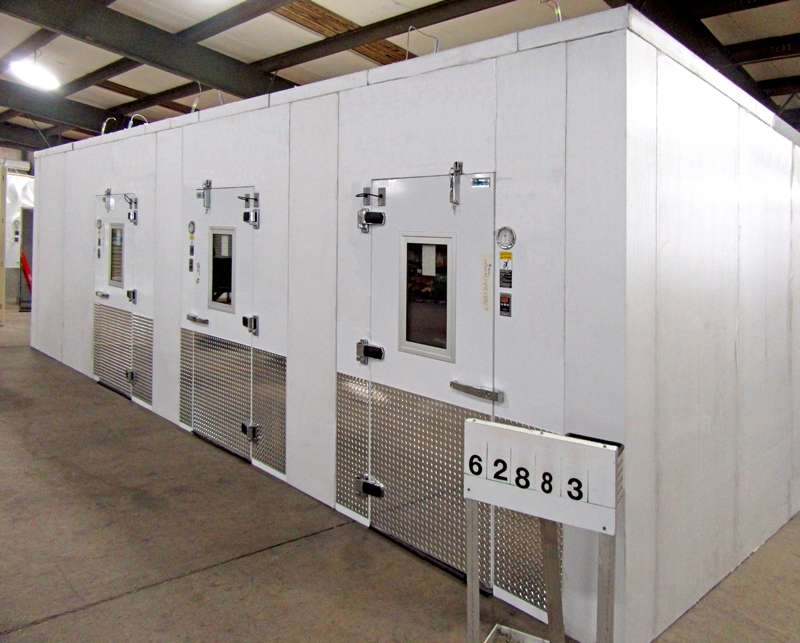 The Thermo-Kool walk-ins recently installed at the SAS Institute consist of a three-compartment walk-in cooler/cooler/cooler combination; a walk-in cooler/freezer combination; and two single compartment walk-in coolers. Pictured is the overall 30’10” x 12’9” x 9’6” high Thermo-Kool three-compartment walk-in cooler/cooler/cooler combination preassembled at the Thermo-Kool factory while awaiting a thorough quality control inspection to ensure there are no “hidden costs” at the time of installation. To maximize storage each of the four walk-ins were manufactured in the actual sizes needed which was accomplished by utilizing Thermo-Kool’s high-density DURATHANE perimeter to manufacture in 1” panel increments with every panel locked-in-place so no cutting or pasting was necessary at the job site. The exposed exterior and interior finishes of the walk-ins are white smooth galvanized with the unexposed exterior finish provided as stucco galvanized. The white smooth galvanized on the interior along with LED lighting assures maximum illumination. Each compartment of the Thermo-Kool walk-ins include a 36” x 84” entrance door complete with 14” x 24” peep windows, three adjustable hinges per door, vinyl swing doors, 1/8” aluminum treadplate kickplates and jamb guards on the interior and exterior and temperature alarms/door monitors with panic switches, motion detectors, battery backups and dry contacts. The exposed exterior of the walk-ins have 1/8” aluminum treadplate wainscot. The project was designed by the consultant team at FDS Design Studio, Washington, DC. Thermo-Kool Customer Account Representatives, Debbi Tisdale worked on the project with the FDS Design Studio team and Thermo-Kool Marketing Agent, Eddie Chell with SpecSource Marketing, Ellicott City, Maryland. Thermo-Kool Customer Account Representative, Allie McCarty worked with Andrew O’Quinn, Jerry Swan and Megan White with Thompson & Little, Inc., Fayetteville, North Carolina, the foodservice dealer on the project, and Thermo-Kool Marketing Agent, Ben Williams with Beacon Sales Group, LLC, Charlotte, North Carolina.